Every year around this time, Eric and I are reminded of what is missing from our lives: a clothes dryer. 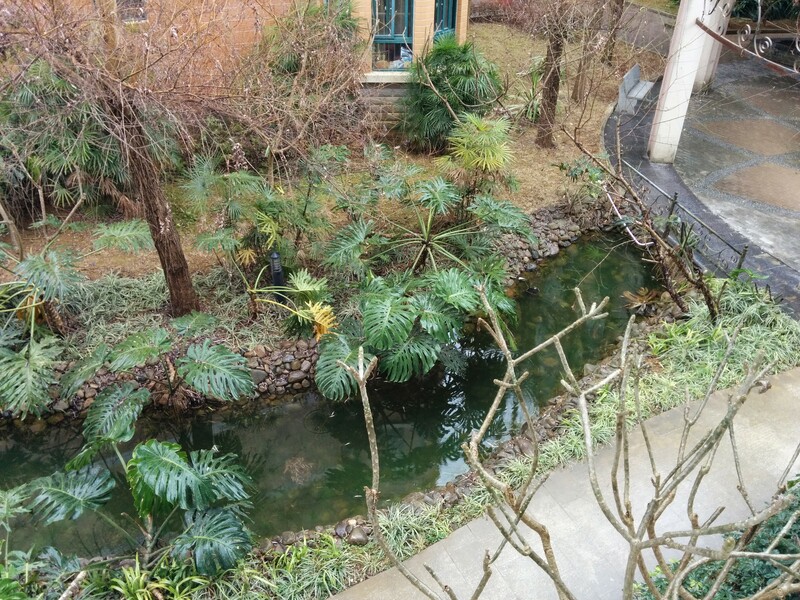 The rainy, wet, damp — but very green — view from our balcony. We do pretty well most of the year with drying clothes out on the line in the sun, but the cold, rainy weather of late winter and early spring is a real bear. Clothes hang there for three, four, five days and are still not dry. We take them off the line not because they’re dry, but because they’ve started to get musty. Why haven’t we purchased a dryer? And why would it sit there without being used? Why in the world would we not use it all year ’round like reasonable people? Well, in short, Chinese dryers are giant inefficient power drains, and they have small capacities. 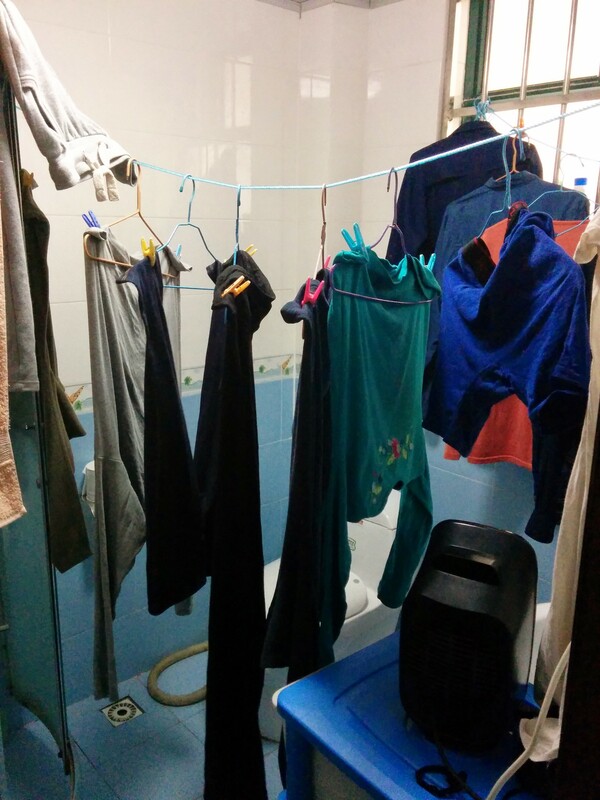 My friends who had dryers when we lived in Nanning reported having to run them for two or three hours to dry one tiny load of clothes. Oh, good, this one is Mrs. Smith approved! Anyway, we’ve opted to go with something a little different. This method makes use of stuff we already have, and doesn’t require storage space when not in use. 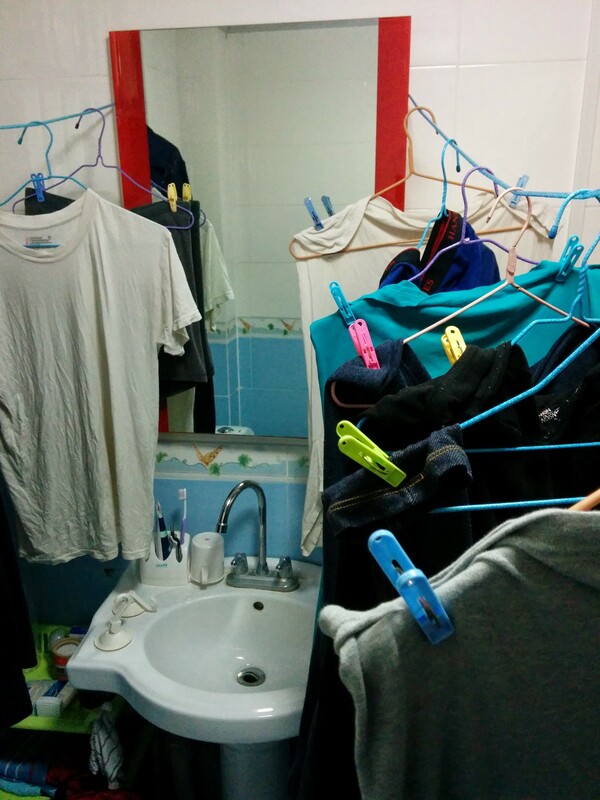 My wonderful husband sets up our bathroom to be a giant clothes dryer. 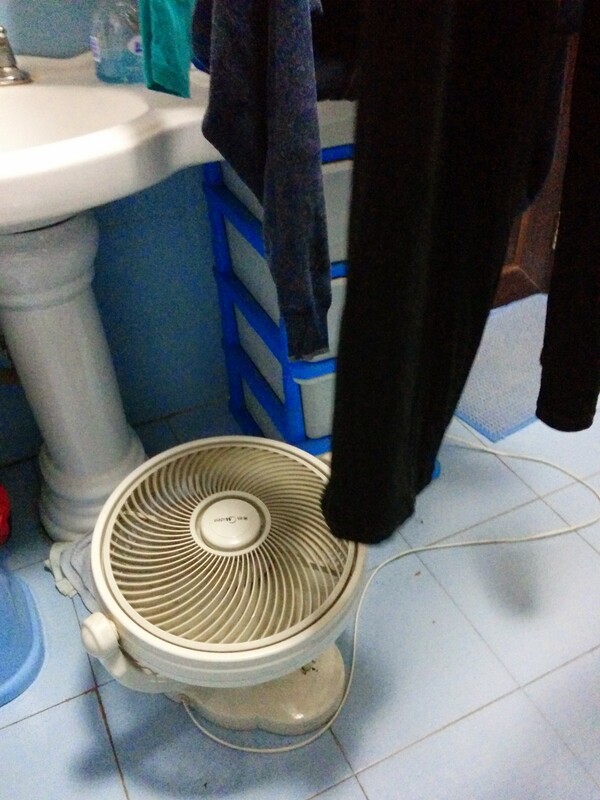 …and a fan on the ground to help circulate the air. Every so often, we turn on the bathroom vent fan and open the door for a minute to help clear out the humidity that builds up. This system works pretty well. A couple of days ago, for example, we rocked through three big loads of laundry in one afternoon, even with the power going out for an hour (not related to running the heater, in case you were wondering). Some of that laundry had already been languishing on the outdoor line for four days. We had run out of space outside and nothing was drying. Yikes. But now all those clothes are toasty and dry and back in our closets. 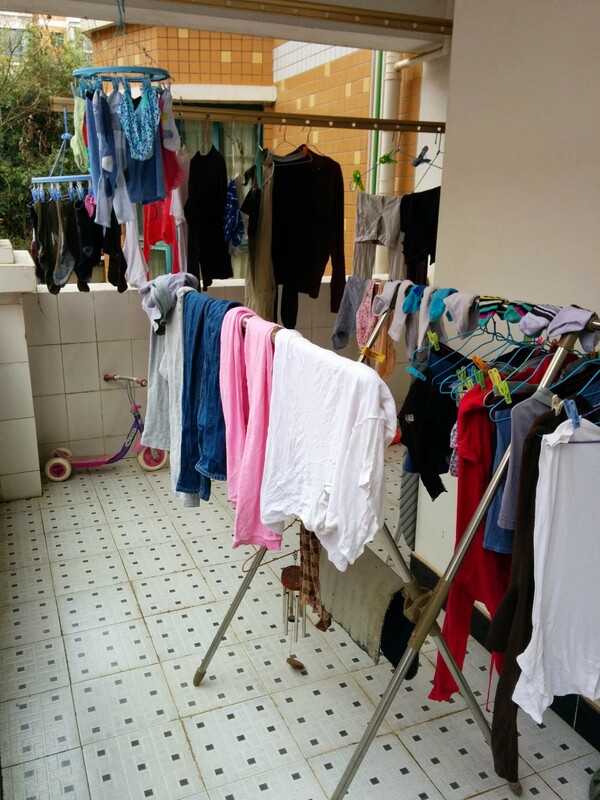 The hacked clothes dryer does not necessarily have to be in a bathroom. In one previous apartment, it was in a little nook off our kitchen. In another, it was in our son’s bedroom. 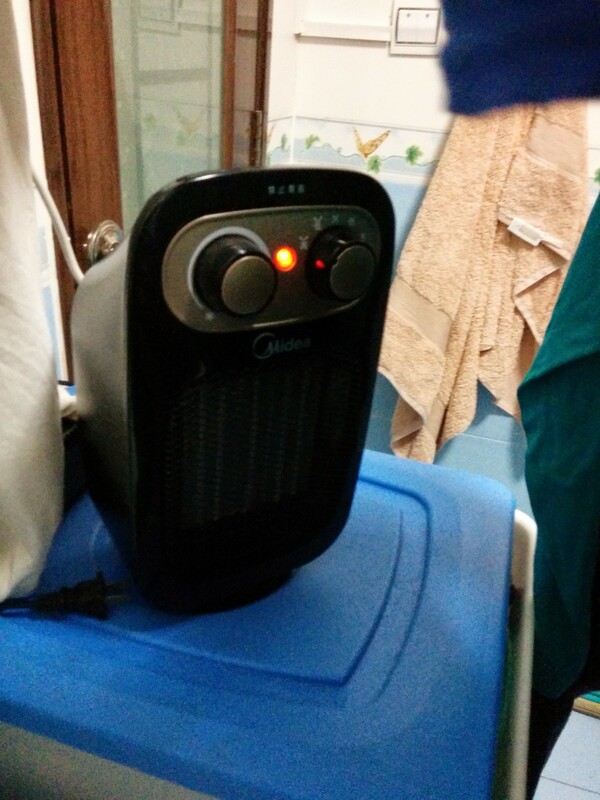 It should ideally be a relatively small, enclosed space so the heater can do its job well. It also helps if the room can handle a bit of moisture building up on the walls. Bathrooms are great. Bedrooms, not so much. Keep in mind that this is just a temporary thing – we normally just do this a few times per year when there’s a big build-up of laundry out on the line due to rainy weather. Otherwise, we stick with our normal laundry line outside.